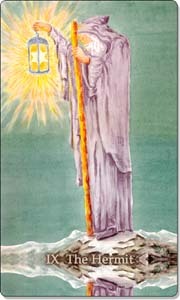 The Hermit is my personality card, because my date of birth adds up to the number 9. The personality card indicates the life lessons that need to be learned during a person's lifetime. 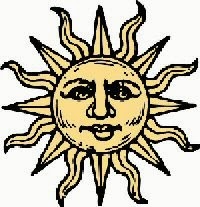 I have just realised that over the last couple of months I have been learning a lot of Hermit lessons, and here I would like to share them with you. 1. Solitude is a blessing and catalyst for creativity and spiritual growth. Not to be mixed up with loneliness! 2. Simplicity is the key to a healthy lifestyle. 3. Downsizing can be the best option, if you want to gain more. 4. Scaling down and streamlining can move you forward in business, work and at home. 5. Keep your environment at home and at work clean, tidy and clutter free. 6. I don't want to be poor, but I know that money doesn't make me rich either. 7. Too many possessions are suffocating. The less you have, the more you appreciate what you have. 8. Sometimes planning can be counter-productive. It's good to have an objective, but meticulous planning can create obstacles and discouragement. Keep focused on your goal, and trust that your light will show you the way as you go along. 9. Having only a few genuine friends is better than being surrounded by many, who are shallow and back-stabbing. 10. Humility earns you respect. 11. Consumerism and greed stops people from realising what is truly important: love, friendship, family, nature, health, creativity, sustainability, spiritual growth. 12. Take your time to figure out what you want. Don't be rushed by outside (or self-inflicted) pressure to make a major decision that will affect the rest of your life. Pressure only makes you tense and anxious. 13. Sometimes it can be a blessing, if you don't get what you want. 14. Don't spend money you haven't got, and don't take out a loan that you will find difficult to pay back. 15. You don't need to experience an adrenaline rush every day to live life to the full. Instead, become more aware of people and surroundings; consciously and mindfully enjoying the company of a friend or loved one, the smell of a rose, the taste of good food, the pleasure of loosing yourself in the work you love or your hobby...Those are the moments you feel alive. 16. Enjoy the simple pleasures in life. 17. Not all that glitters is gold. In fact, you don't need gold. Love and health is much more valuable. 18. The most important relationship you have is with yourself. Make sure you give yourself plenty of love, nurture, trust, patience and understanding. 19. It's possible to be peaceful amidst noise, trouble or hard work. Just be calm within your heart. 20. It's perfectly okay to be the odd one out! Not fitting into a crowd develops your independence and power of observation. 21. Perfectionism blocks creativity. I allow myself to be imperfect. These are my Hermit life lessons I have gained so far over the years. Work out your personality card and explore your life lessons. Have fun! 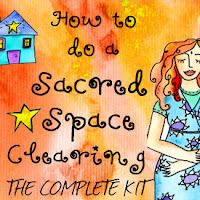 Simplify your life with sacred space clearing - click on the image to get your copy of this wonderful kit. Make sure you subscribe to my feed to receive the latest content straight into your inbox when published. Great lessons. Many of them resonate for me at the minute as I find myself in a Hermit year in 2012 :) Thanks for sharing, Christiane.